Christmas/New Year holidays ended for us this weekend. What a glorious three weeks it was! I always value the relaxation and amount of time I can spend with the kids and Nadia. When Nadia and I are working, we are so busy that at times we don’t get to spend enough time with the kids. We had a wonderful last weekend. The weather finally got better, with sunshine and warmer temperatures. 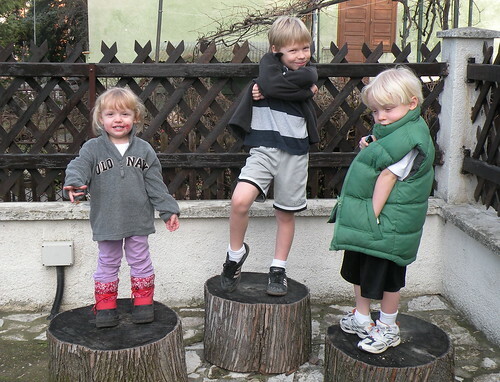 The kids are shown in our yard before we went and played tennis at the local school yard. I also went for a long bike ride with Tim. Both Nadia and I ran quite a bit over the holiday. Saturday evening we went to the basketball game. Red Star with its new coach, defeated city rival FMP 87-73 to move to 7-8 for the season. They looked better with the new coach by hustling more and shooting the ball well. They still have problems with good, attacking guards. They still have a ways to go. 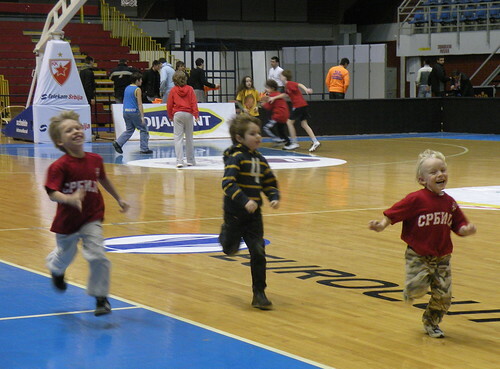 The boys most enjoyed being able to run around on the court after the game. Owen inherited by bow legs.